Boeing’s 787 Dreamliner Historic First Flight From Paine Field, Everett, WA. The presentation includes: Video of a 787 Dreamliner first flight, aerospace structural testing practices, aerospace engineering design practices, aerospace manufacturing, fiber composite materials. My video camera kit had been prepared months in advance, ready at a moment’s notice for the first maiden flight of Boeing’s 787 Dreamliner—21st Century entry airliner. Finally, Dave Waggoner, the director of Paine Field Airport, queued me into the date to witness an evolutionary advance in commercial aviation. My home is only a short drive from Boeing’s production facilities at Paine Field, Everett; so I was motivated to video record this “making of 21st century aviation history.” Due to initial production delays, an entire year went by before I received reliable news of the 787-8 wide-body, long-range airliner was ready for her much-anticipated maiden flight. 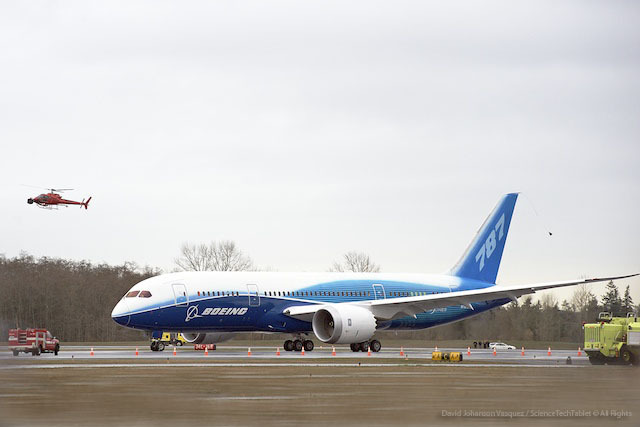 The 787 Dreamliner’s first flight was at 10:27 a.m. PST, December 15, 2009. The 787, first flight video project brought back some great memories from my former career as an aerospace photographer with the Boeing Company. When first hired on by the iconic aviation leader, my assignment involved providing video support for the Everett plant’s test engineering groups, who were conducting bulkhead fatigue test on airline fuselages. In preceding years, some airlines began experiencing inflight catastrophic failures related to metal fatigue. Tragically the determined cause was from the age of the aircraft, specifically, stresses created when interior cabins went through an excessive number of pressurization cycles. An event in the 1980s, of a Boeing 737 was dramatically documented as it safely landed with a massive section of the fuselage missing. The Aloha Airlines, 737 jetliner experienced a catastrophic failure due to metal fatigue. The metal fatigue issues caused from pressurization cycles on the aircraft were not clearly understood, so the FAA required engineering test to research the potential safety threat.A series of highly documented Test were conducted over a period of months; going through thousands of pressurized cycles. The purpose was to recreate what a jet airliner physically experiences when the cabin is repeatedly pressured and unpressurized — as in every-time an airliner takes-off, gains altitude and eventually returns for its landing. Our team of scientific photographers had series of video cameras, strategically placed within the test bulkhead, which sat shrouded in layers of protective coatings, in a remote section of the Everett facilities. Over-pressurizing the bulkhead eventually caused the anticipated failure, announced by a thunderous sound of cracking metal. The bulkhead test was well documented using various engineering test methods and imaging equipment. Valuable test data gathered was immediately analyzed, studied and put to methodical use for redesigning, engineering and manufacturing safer jet airlines. 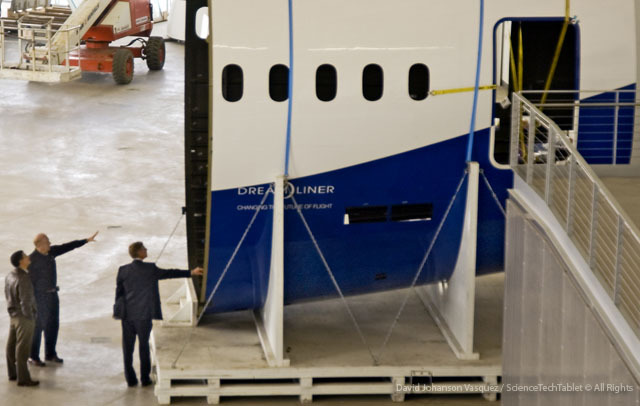 Examining a fuselage section of the 787 which uses composite carbon fiber materials. It’s been my experience, which confirms for me, what commercial pilots and engineers claim regarding Boeing’s reputation with its conservative practice of “over-engineering” their aircraft. Historically, an over-engineering approach has proven itself as a life saving benefit — with countless Boeing aircraft surviving horrific damage… yet, still landing safely. Documentaries on WWII aircraft feature shot-up Boeing aircraft returning safely, is an example of over-engineering. For teams performing test monitoring, with elaborate configured structures, attached string gauges and actuators trying to force a break of an airplane part — the aerospace test may go on for days, or even months — the experience feels like sitting in bleachers for hours while watching slow-motion glacier races in progress. All the invested resources of time and effort, which goes into these aerospace component test, helps to assure the flying public’s safety and the airlines performance records. Engineers enjoy seeing how much torturous abuse their designed support systems will take before they bend, crack or break. At the instant a component does finally fail [normally, after far exceeding the range of what the it was designed to do] you’ll hear a loud noise caused from a test-object going beyond its limit. The sound of a breaking part, ends the tension of monitoring a test for hours or days — in an instant, the group of test engineers and technicians start cheering like a goal was scored by a home team in a stadium full of their fans. Boeing 787-8 Dreamliner taxiing for its historic, maiden flight on December 15, 2009 from Paine Field Airport, Everett, WA. One of many significant technological improvements for the new long-range, wide-body 787 Dreamliner, is a high percentage of composite, carbon fiber materials used in its construction. The amount of composite, materials employed in today’s aircraft have substantially increased from when it was initially developed and used in military aircraft. I recall, how amazingly light wing spares made of carbon fiber composite materials are, when moving them under lighting setups at Boeing’s Gateway studio. It was fascinating observing and photographing the manufacturing of composite materials, as the process involves using massive heated autoclaves to form predesigned sections for aircraft structures.Now, remember the bulkhead test from a previous paragraph? Carbon fiber composites eliminates the issue of metal fatigue associated with pressurizing passenger cabin space. Less concerns over metal fatigue allows for more pressurization in the cabin for passenger comfort — more importantly, the integrated use of composite materials ensures greater safety, with substantially less risk to the structural integrity of the airliner. 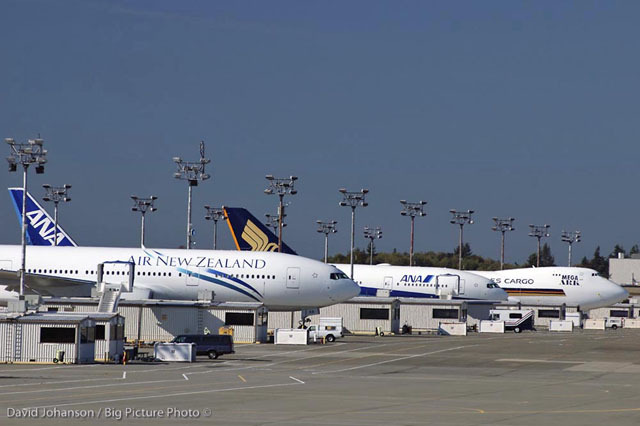 Is Boeing’s Reliance On Outsourcing The Main Culprit For The 787 Dreamliner Being Grounded In A Global Lockdown? A heavy dependence on foreign outsourcing is cited as a cause for unforeseen 787 production delays. Consistent, quality control monitoring becomes problematic when components are manufactured offsite, as result these issues can sometimes lead to extended, unanticipated problems. Outside vendors are capable of producing equal, if not superior quality components to that of Boeing in some technical areas. In fact, there are legions of aerospace companies in the Puget Sound region, which supply critical parts to the 787 Dreamliner’s manufacturer. Some outsourcing is absolutely necessary for Boeing to compete with Airbus. The concern is outsourcing critical components in a new airplane program, which is attempting to use technology never used in a commercial airliner. It’s ironic, li-ion batteries are at the center of the 787’s grounding — lithium batteries have been a concern for over a decade to the FAA, TSA & NTSB, even leading to bans & restrictions for passenger’s to bring on commercial flights. It’s almost hubris or a form of high-risk gambling, to “initially” rely so heavily on outside vendors [GS Yuasa, the Japanese firm making the li-ion & Thales, the French corporation making the batteries’ control systems] for producing an unproven, prototype system. metrics are emplaced to assure critical standards are met for each component, it’s only a matter of time before a failure will occur. Boeing has traditionally been an aerospace company, which “over engineers” it airplanes & errors on the side of safety. Hopefully the company has maintained & continues to practice these quality assurances. Outsourcing is practical both economically and politically for companies with international sells. It’s a successful strategy Boeing has used for many years; outsourcing has proven to provide incentives for foreign airline companies to buy Boeing aircraft, in order to support their own domestic aerospace industries. The American auto manufacture Tesla, had similar “thermal runaway” issues when first using li-ion batteries to power its Roadster. Tesla Motors, benefited from its learning curve by switching to Lithium Iron Phosphate batteries, which run at cooler temperatures. The innovative auto manufacture also developed its own battery pack architecture, with proprietary liquid cooling system packs — for controlling battery cell temperatures within self-contained, metal lined enclosures. The nontoxic, Tesla battery packs are manufactured domestically in Northern California. Perhaps Boeing should be considering manufacturing all critical systems in-house and domestically as Tesla has done. According to MIT Technology review’s – Kevin Bullis, who points to Boeing’s battery manufacture, GS Yuasa’s web site , the 787 is using Lithium Cobalt Oxide batteries, which it also manufactures for the International Space Station. These batteries are categorized as “high-energy storage capacity,” but are not considered resistant to heat as other battery chemistry. Another issue I’m speculating could contribute to the 787 li-ion batteries overheating relates to Boeing reintroduction of an [electrical compressing system] to provide higher pressurization for the cabin environment. This type of cabin pressurization system requires more electrical energy than standard systems, so could this be putting additional demands on the batteries? Part of the advantage to using more composite materials in the 787 was to reduce metal fatigue caused from the cabin pressurization cycles. The Dreamliner uses higher cabin pressure than most aircraft to make it more comfortable for passengers — however, li-ion battery manufactures specifically warns against over-pressurizing these batteries. Is the cabin pressure contributing to pushing the li-ion beyond their tolerance? Whether or not the stated technical issues are of a real concern for the onboard battery system packs, can only be determined by thorough testing. Again, it’s to early to know the exact extent of the problem with the 787’s battery systems. The issue will soon be isolated, as Boeing has long history of thoroughly testing and over-engineering its aircraft systems. One thing is certain, it’s rare for Boeing to experience a new aircraft being grounded simultaneously by Japan’s transport ministry and by the FAA.